What happens in a cell when genetic information is translated into proteins? In order to study this process, researchers take a closer look on one particular biomolecule inside the cell: messenger ribonucleic acid, mRNA for short. This biomolecule plays a major role in all cellular processes – and it is also the focus of joint research being carried out by two research groups at the Cells-in-Motion Cluster of Excellence at Münster University. 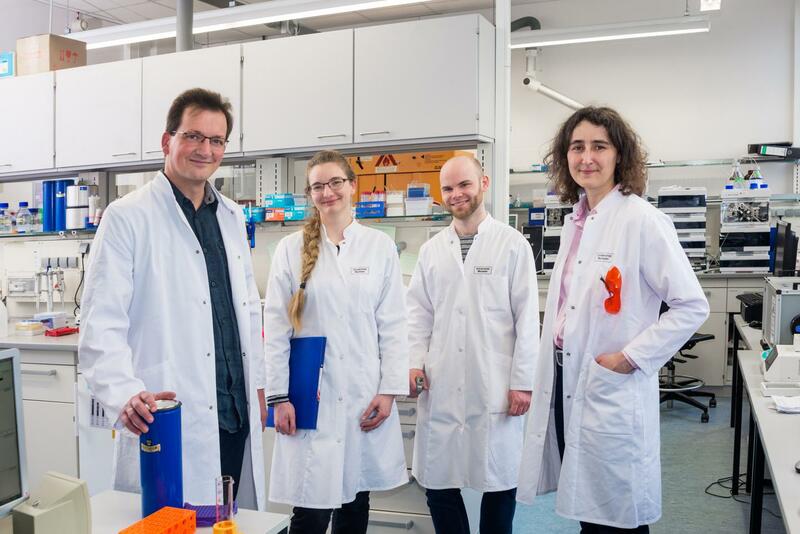 One of the groups consists of biochemists and is headed by Prof. Andrea Rentmeister; the other is made up of molecular biologists and is led by Dr. Sebastian Leidel. In their interdisciplinary collaboration, the researchers have succeeded for the first time in chemo-enzymatically labelling an important change in messenger RNA – the so-called m6A modification – and subsequently detecting it precisely by means of modern molecular biological methods. "This new approach enables us to locate modifications in mRNA with a greater degree of accuracy than ever before," says Andrea Rentmeister, a professor at the Cluster of Excellence who led the study. Knowing where and to what extent m6A modifications occur can later help researchers to examine more closely the role played by this modification in physiological and pathological processes. The study has been published in the Angewandte Chemie (International Edition) journal. The genetic information of the DNA is transcribed into messenger RNA in a process known as transcription. Following transcription, mRNA transports the genetic information from the cell nucleus into the cytoplasm. There it serves as a guide for the production of proteins. Proteins, for their part, are the workhorses in a cell and carry out all the cellular tasks. Like double-stranded DNA, single-stranded RNA consists of a chain of so-called nucleotides. In RNA, however, there are also many chemical changes to these nucleotides – known as RNA modifications. These modifications occur after the genetic information has been read. In the process, simple atomic arrangements – the methyl groups – are attached to the nucleotides. "One modification currently being hotly debated is the N6-methyladenosine, known as m6A for short," says Andrea Rentmeister. There is a special reason why this modification is highly interesting, and that is because it appears to be responsible for a series of biological processes, for example for the circadian clock. It also seems to play a role in pathological processes, for example in some forms of cancer or in viral infections. In order to gain a better understanding of m6A, the researchers want to find the answer to the question: Where exactly in the mRNA is the modification located? To find this out, they have to label it. For this purpose, biologists often use antibodies that attach themselves to the molecule being investigated. This method has its limitations, however, the antibodies can bind not only to the modifications of the mRNA, but also to neighbouring nucleotides. This makes it difficult to locate the modifications precisely. "We now wanted to carry out the labelling with a chemical approach," Andrea Rentmeister explains. So, for the first time, she and her team used propargyl groups, a slightly longer hydrocarbon residue. The researchers coupled the propargyl groups to the cosubstrate of the enzyme, and combined all three components with mRNA molecules in the test tube. In its chemical structure, propargyl is similar to a natural molecule bound by a methyltransferase. Methyltransferases for their part are enzymes that are responsible for the modification of mRNA. Thus, the methyltransferases were able to transfer the propargyl group to the RNA. Using so-called click chemistry, the scientists were able to isolate and purify the RNA with propargyl groups. In order to detect the specifically labelled modifications, the researchers used a special enzyme to transcribe mRNA back into DNA. The resulting DNA strand is a copy of the previous RNA and can be investigated using molecular biological methods. A team of molecular biologists at the Cells-in-Motion Cluster of Excellence and at the Max Planck Institute for Molecular Biomedicine in Münster headed by Sebastian Leidel sequenced this newly synthesized DNA strand, in other words they read the sequences of nucleotides. In doing so, the researchers used a method known as Next generation sequencing, which enabled them to determine the sequences of nucleotides extremely efficiently. "This method allows us to analyse thousands of sequences in parallel", explains Sebastian Leidel. Because the researchers had labelled the modifications with the propargyl groups, the enzymes necessary for the rewriting of the RNA arrested. As a result, they failed to transcribe the RNA back into DNA. "The enzymes ceased any activity at the labelled sites and have generated some kind of stop signal," says Katja Hartstock, a chemist and lead author of the story. The researchers were able to determine these stop signals during the sequencing, which meant that they could detect the sites at which the mRNA modification occurred. After the initial experiments in the test tube, the researchers applied their new method in a culture of human epithelial cells – HeLa cells. The researchers fed the cells with a propargyl-labelled so-called amino acid precursor, which the cells "ate" and subsequently started the labelling. As already established in the test tube, the propargyl groups attached themselves to the RNA with the help of methyltransferases and allowed the detection of the mRNA modification sites by Next generation sequencing. The next step the researchers want to take is to apply their method to living organisms in order to study the significance of the modification within their development. Zebrafish are well suited for this purpose as they develop very fast and the modifications are therefore transcribed faster – and are also removed again faster.